According to a recent survey conducted by British job site Reed.co.uk, approximately 33 percent of employees admit to using social networking within the office. Facebook was the most popular choice preferred by 45 percent of the people that did admit to logging into a social network. Facebook was followed by LinkedIn, a social network that’s becoming commonly used to research potential candidates for job openings. Other choices included video sharing site YouTube, Twitter and various blogs. Marketing and IT professionals are the most likely to be browsing social networks at work while engineers and accountants were far less likely to log into Facebook during the workday. While two thirds of the respondents believe that companies have a right to ban social networks within the workplace, less than 30 percent of the companies in the survey completely block access to all social networks while another 40 percent limit access to social networks. Thirty-two percent didn’t block any social networking sites or bother to set up a policy to forbid employees from logging into the networks. Of the people that did log into a social network on a daily basis, 35 percent claim that it was specifically for business. Ten percent claim it was for personal reasons and 55 percent went with both options. While 62 percent of the employees only log into the social networks one to two times a day, the remainder log in more than three times a day. Five percent admit to visiting into a social network over ten times a day. 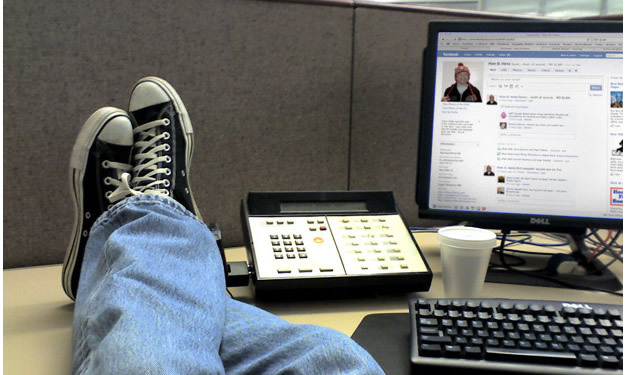 Many employees do attempt to keep social network visits on personal devices though. Sixty-four percent check networks like Facebook and Twitter on mobile devices such as a smartphone, but 36 percent do use a work computer to log into social networks. As more employers look into how much time employees are spending on Facebook, it’s likely that companies will become more restrictive with network access rights.